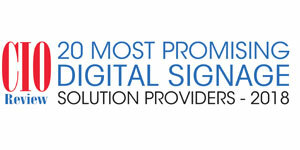 There has been a substantial growth in the availability of digital signage to users today. Wider yet slimmer screens, sleeker video walls with ultra-thin bezels and interactive visuals are together driving innovations in the industry. Video walls that blend seamlessly with the surroundings not only provide a larger and more detailed view but also make an impressive impact on the audience. In addition, video walls offer a great scope for interactivity and personalization. While the digital signage industry is known to focus primarily on the size and quality of screens, companies can no longer afford to overlook the quality of customer experience. Along with leveraging touch screens to create interactive displays, the introduction of voice recognition and programmed behavior based on recorded data has been giving personalization a major boost. Thus, an intuitive digital signage strategy can help companies relate to their customers in a better manner. Furthermore, web-based services now allow digital signage content to be tailored automatically with respect to varying situations, making responsive content a crucial component. Providing users with information relevant to their surroundings can enable companies to engage more users and also deliver an enhanced customer experience. To help companies stay on top of these digital signage trends that go hand in hand with the advances in technology, CIOReview presents you an edition of Digital Signage Solutions. Our distinguished selection panel, comprising CEOs, CIOs, VCs, industry analysts and the editorial board of CIOReview, has shortlisted some of the most effective Digital Signage solutions.